It wasn't long ago that a respondent to this column accused me of ranting about adobe, of dismissing anyone who wasn't doing it my way. I admit to being unrelenting in making the points that, one, adobe nowadays is not really adobe (you will have to check back issues because I am finally tired of repeating the reasons why), and two, adobe as a style has not been allowed to progress in Santa Fe because of myopic and restrictive planning and zoning ordinances. For years I have been beating those seemingly dead horses. I am pleased to announce a huge advance that gives me hope for the future of adobe, namely the application of the real thing in a Contemporary context in Santa Fe. Alas, it is not in the historic district, or even in the city limits -- but it's close enough to be a milestone. As to beating dead horses (and believe it or not, this is to the point), my father had a long-time and very prized employee in the water well drilling business who did beat a dead horse. Tony Barela, in the early decades of the last century, was hauling wood back from the Caja del Rio to Agua Fria on a wagon drawn by a borrowed horse because his own was lame. The wagon stuck in Arroyo Calabasas and the horse would not move. Tony, sadly, took a piece of piñon from the wagon and coaxed the beast a little too forcefully. The story goes that the horse was felled with one impatient blow followed by a few more in a futile attempt at reviving. I empathize, patience not being one of my virtues, but Tony had some difficult explaining to do. My ranting was something like Tony Barela's response to the borrowed horse. I just wanted to get somewhere more quickly than the horse was willing to travel. After all, I could validly ask, how many Contemporary homes can you identify in Santa Fe that have been built with real adobe blocks and plastered with real mud? I'm. . . waiting. . . .
Then, Tony Atkin, Philadelphia architect and rancher's son from the Arizona strip, designed and built the most stunningly beautiful, and significant, Contemporary adobe house in Santa Fe County. So, to some degree I can calm down and bask in Tony A's victory. When his house is featured in the 2007 Parade of Homes, don't miss it; it is a brilliant piece of work. I wish it could have been built on Garcia Street or Camino Santander. If Tony permits, I will host a brunch for the H-board at his house and ask, before the second Bloody Mary, why this could not happen in the historic district. Tony has shown that adobe construction does not need to be retarded in technology or in form to be pleasing to the eye, responsive to place and intellectually stimulating. Is there a Pueblo Revival or Territorial style house built here within the last ten (or twenty) years that meets those criteria? When we do get to the second Bloody Mary, I will tell the tale of two Tonys, one who lost patience and beat the dead horse, and the other who simply, silently, with grace and impeccably good taste advanced the cause. Part II. What Would Archibald Say? In 1949, Archibald MacLeish a shrewd commentator on the American experience, noted: "The soul of a people is the image it cherishes of itself; the aspect in which it sees itself against its past; the attributes to which its future conduct must respond. To destroy that image is to destroy the means by which the nation recognizes what it is. . ." His commentary had nothing to do with architecture, but with the mounting fear of communism, its numbing homogeny and threat to individual choice. Forgive my leap from political hysteria to the world of real estate, but the image Americans cherish is not, I think, the dispiriting cookie-cutter monotony of Levittown (see Santa Fe's version in Figure 2). When MacLeish invokes the past, it is not a static continuum but an epic of dynamic change, reassessment and creative response. His future, based on the attributes of the past, is enlivened by intellectual exploration. Our image of ourselves, our soul in MacLeish's metaphor, is blurred and deadened by uniformity. 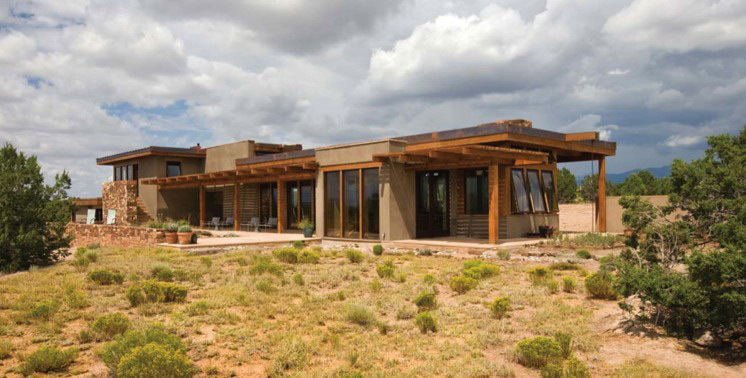 The last ten years have seen an explosion in architectural uniformity in Santa Fe; in Las Campanas, Aldea, Rancho Viejo and a host of other, smaller developments whose architectural covenants were apparently written by Big Brother. We have seen the mold broken at Zocalo, at least in terms of brown. In the city center and historic districts there have been some encouraging developments. We seem to be moving closer to adopting some progressive new codes that will allow us to address existing conditions in historic buildings more favorably. And, although the City Council and Historic Design Review Board continue, as they always have, to practice inconsistency as a credo and to use the historic ordinance inappropriately as a zoning weapon, they have made laudable progress towards bringing residents back to the core of the town. Nevertheless, we continue to see preservation "policy" and historic "style" in Santa Fe throbbing uncomfortably in the narrow space between ossification and a penchant for faux. What would Archibald say about Santa Fe's soul?